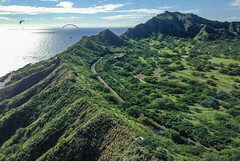 A strange combination of sea breeze and pre-frontal Kona wind powered up Diamond Head for a first winter flying window today, drawing over a dozen monkeys out of the woodwork on a sunny Thursday. Six flew, most soaring for multiple long flights, punctuated by a variety of dramatic top landings. Conditions were super east and light, with fat thermals bubbling up from Kahala. A band of solid rain and rainbows offshore slowly chugged its way across the horizon but never threatened to approach. The window closed after about three hours, as visitor Jay Z noticed on his way to the beach. It was a great vibe as usual, with scores of family members and spectators enjoying the vibe in the park. Love that crazy diamond! Here's to more chances this winter for everyone to enjoy our crown jewel! Roll call: Jorge, Cade, Becca, Motorhead, me, Jay Z, Thai, Jerry, Maui Tim, Dusty, Frank, Thom, Brent, Garrett, assorted spouses, and undoubtedly more. Thanks Alex, on the Roll call the first 6 flew the remainder like me read about it. I got there to see no one in the air but at least 6 happy faces. PS The grass does not grow under Motorheads feet, he hasn't missed many flyable days on this trip. Looks like another great day for the non-jobbers. I don't think I've ever seen pictures taken from that far around the east side of DH, at first I thought it was KKC! Good to see some glittering diamonds while I'm broiling in Hell.